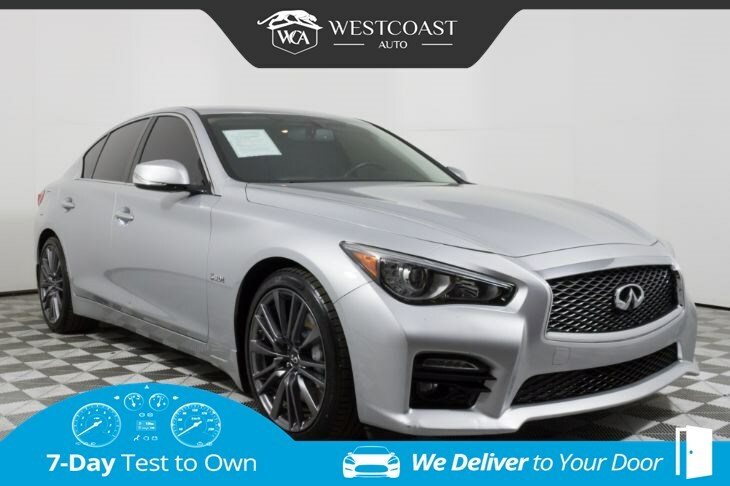 Reward yourself with maximum driving pleasure behind the wheel of our One Owner, Clean CarFax 2016 INFINITI Q50 Red Sport 400 that's a knock-out in Liquid Platinum! Is moved by a Twin Turbo 3.0 Liter V6 that unleashes a potent 400hp the power is managed with our responsive 7 Speed Automatic transmission with adaptive shift control. Our Rear Wheel Drive luxury and rewards you with astounding acceleration and near 26mpg on the highway. The epitome of modern luxurious design, our Q50 Red Sport exudes artful and sculpted drama that turns heads with its prominent Sunroof, Red S badging, and exclusive wheels. The innovation carries through to the interior that has been designed with a fully customizable digital environment that saves audio, climate settings for each intelligent key. Appreciate supple leather seats, dual-zone automatic climate control, push-button ignition, and more. You'll love Infiniti's InTouch system with the Bluetooth hands-free phone system and a hands-free text-messaging assistant. Crank up the premium sound system with satellite radio and enjoy turning heads in this spectacular machine. A host of safety features are on board to protect you; an advanced airbag system, Zone body construction w/front/rear crumple zones, a rear view camera, and vehicle dynamic control just to name a few. This Sedan will excite all of your senses! Print this page and call us Now... We Know You Will Enjoy Your Test Drive Towards Ownership! Great quality, easy financing and affordable prices aren't the only things that make Westcoast Auto Sales the first choice of many discerning auto buyers. Stop in and See California's Dealer of the Year!